The Tranvia in Manila during the Pre-War period was run by the Manila Electric Railroad and Light Company (MERALCO). It was destroyed during World War II and was never revived. During that time, a railway system was being proposed in Mindanao by the Commonwealth government of President Quezon and it never came to fruition. 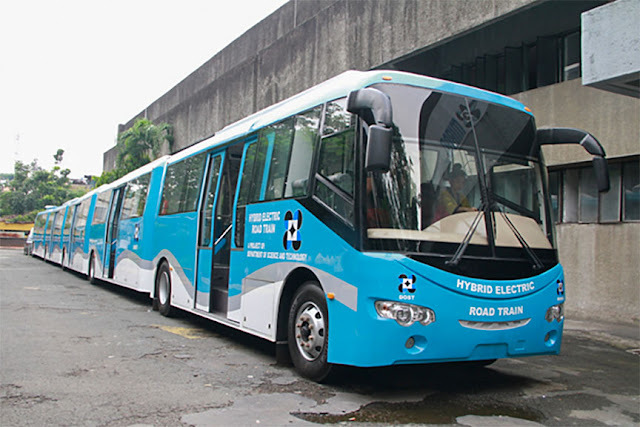 Today, General Santos City has unveiled its Electric Road Train (ERT), the first in Mindanao. The ERT was developed by the Department of Science and Technology (DOST) and serves as the centerpiece of the Local Government Unit (LGU of General Santos City. This endeavor will also serve as a template for other LGUs. As per the LGU, this is in consonance with their effort to make GenSan a smart and green city. The ERT uses hybrid technology that enables it to run on electric power with a complementing diesel engine. Each train has a capacity of 240 passengers. Currently, GenSan is having problems with its smoke belching tricycles that number at 12,000 while according to studies, only 9,000 are needed. The reason for the preponderance of these tricycles is because many routes in the city is underserved by jeepneys. This development will be the building blocks wherein clean and green transport will be further developed for the city.